Create a homestead just for your feathered friends by adding this Home Bazaar Log Cabin Bird House to your backyard. The striking detailing, familiar shape, and classic colors throughout this home are sure to form a rustic theme in your yard, while offering an avian family a comfortable roosting spot. Varied gray tones on the steeply pitched roof evoke slate, and contrast the brown of the rest of the shelter. Two dormer window shapes on this roof showcase its height, and a rope hanger at its peak allows the item to be placed on a branch. A 1.25" diameter entry hole beneath the roof peak enables chickadees, nuthatches, or wrens to enter the unit, while a small door at the base of the opposing side allows you to clean the home at the end of each season. Two small holes on the base of the unit help drain any captured water, and a gap beneath the roof overhang aids in ventilating the shelter. The wooden construction enhances the rustic appeal, and the log shapes on the front and back of the home sport rounded facades for even more dimension. Three wooden porch columns not only support the roof overhang; they also showcase a faux lantern, rope, and railing. A bench and barrel rest near the stairs, and a dog figure brings whimsy to the piece. The item is fantastic for showcasing the joys of cabin living, and its brown hues enhance your landscaping. 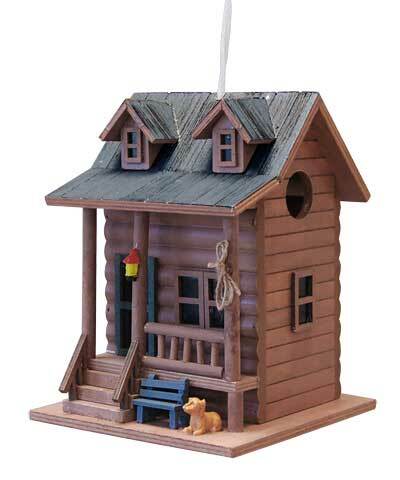 Offer birds their own rustic retreat by placing this Log Cabin Bird House in your backyard. Note: Climate and the elements will weather this home and change its appearance over time; however, weathering will add to the item's natural charm without compromising its function. Should you want to preserve the finish (paint) of this house, you should cover it with several layers of a polyurethane product that is recommended for marine use (UV Rated). You should expect that once left outside, the item will weather and require refinishing.